My name is Karl Sheldon Wacey. Do you have any questions about my English courses? The following online English lessons have been designed by a professional English teacher to provide an effective solution covering a wide range of English language needs. The lessons are quite dynamic, taught on Skype utilizing multimedia, online videos and interactive exercises. This course is aimed at business professionals who need to improve their business and social English skills rapidly, effectively and efficiently. The course will be taught using the successful Market Leader series, with additional supplementary material, and will include the four skills of reading, writing, listening and speaking. Feedback will be given at the end of each lesson with tips on improvement. This course is aimed at English language students who want to improve their overall fluency and accuracy as well as develop the four skills of reading, writing, listening and speaking. The course will be taught using the successful English File series to provide practice in a meaningful context, with additional supplementary material. Feedback will be given at the end of each lesson with tips on improvement. This course is aimed at those students who are studying for one of the following Cambridge examinations: FCE, CAE, IELTS, BEC Preliminary, Vantage and Higher. Feedback will be given at the end of each lesson with tips on improvement. Interviews can be awkward and nerve-wracking at the best of time. However, imagine having an interview for an important job or internship in a language which is not your own, such as English! Whether your internship is in the USA or the job is with an English-speaking multinational, I provide tips, role-plays and practical advice to non-native English-speaking candidates to improve their chances of success at interview. 6. Watching DVDs rather than TV is much better as a learning resource for a lower-level learner of English. DVD has a replay and subtitle function to allow you to catch any information you might have missed the first time. 7. For advanced learners, however, watching TV is more demanding as it only gives such students one chance to hear something correctly. This is particularly useful as it provides great practice for speaking to native English speakers so that you don't need to ask them to repeat themselves. 8. Try reading graded readers to increase your word power and structure awareness. Feel a sense of achievement when you turn the last page! 9. If you can't get a hold of graded readers, try children's books! Although the grammar and vocabulary are easier, such books provide a good alternative to the graded reader. 10. If you are studying a particular grammatical concept (e.g. the passive voice), search newspapers to see if you can recognise it and the context in which it is used. Would you like to study for a Master's degree at an English-speaking university? Widely accepted by numerous academic institutions and employers in the UK, Australia, New Zealand, South Africa and North America, Academic IELTS is your key to a brighter future at home or abroad. However, to make this dream a reality, you will need to secure a band 7.5, or above, in your Academic IELTS test. Impossible? Not really, but to get such an IELTS grade, you will need the guidance of an experienced IELTS teacher to help you along the way. So if you are a motivated IELTS student who wants to do the Academic version of the test, then I would love to hear from you. Find out more about the IELTS examination here. 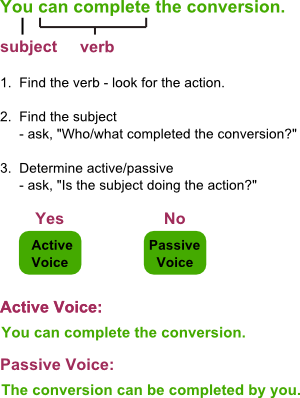 To determine the voices of Active and Passive please follow this three step process.